Clay Carroll was a popular relief star in the heyday of the fireman, a bullpen workhorse who could be used in a variety of difficult situations. From the end of June 1968 through the 1975 season, he saved a then Cincinnati Reds record 119 games and compiled a 1.39 earned-run average in 22 postseason games. Carroll was named to the 1971 and 1972 National League All-Star teams, and was named The Sporting News Fireman of the Year in 1972 after saving what was then a major-league record 37 games. He recorded victories in Game Four of the 1970 World Series and in Game Seven of the 1975 World Series, the game that brought the Reds their first world championship in 35 years. Carroll got the nickname Hawk from teammates.1 He was known as a fierce competitor who at the same time kept the Cincinnati bullpen entertained and loose. “Did you ever hit anybody on the head with a ripe tomato?” he once asked in the bullpen. “It sure makes a funny noise and there’s a way it flattens out to really mess up a guy’s hair.”2 He became the leader of the relief corps—with Carroll, Pedro Borbon, Tom Hall, and later Will McEnaney and Rawly Eastwick, it was the excellent but unsung facet of the great Big Red Machine teams. “Lucky, I had this arm and I liked playing baseball,” said Carroll. “Did it every chance I got when I wasn’t working in that mill, or loading watermelons onto trucks, or whatever job came around. I went to school and I was good at sports.”6 He played well enough to draw attention of at least one club. Former major leaguer Dixie Walker signed Carroll for the Milwaukee Braves as an amateur free agent in 1961 for $1,000. Carroll began his professional career with Davenport (Iowa) of the Class D Midwest League, where he finished 7-10 with a 4.20 ERA. The next year he led the Class C Pioneer League in victories, sporting a 14-7 record for Boise, striking out 223 hitters in 181 innings, while pitching 16 complete games. He split both the 1963 and 1964 seasons with Austin of the Texas League and Denver of the Pacific Coast League, the top two affiliates in the Braves’ system. After winning 11 and 10 games over the two years, Carroll was called up to Milwaukee in September 1964. Carroll’s first trip to the big show was a smash success. He pitched 20⅓ innings in 11 games and allowed just four runs (all in his lone start), good for a 1.77 ERA. He won his first game on September 26 in Philadelphia (this was the fifth straight loss by the first-place Phillies during their infamous 10-game losing streak), and the next day he bought several copies of the newspaper, and pointed out his picture in it to people in the hotel lobby.9 He had come a long way from Clanton, Alabama. He won another game four days later. Carroll started the 1965 season in the majors but was sent down on June 1, returning in early August. For Milwaukee Carroll went 0-1 with a 4.41 ERA in 19 games. He played for two months for the Atlanta Crackers, the Triple-A affiliate of the Braves, and pitched 13 games, all starts, finishing 3-6 with a 2.42 ERA. After the season the Milwaukee Braves became the Atlanta Braves. The 6-foot right-hander usually played at about 200 pounds, but in the 1966 and 1967 seasons he got his weight up to about 215 pounds, which he later blamed for his poor 1967 season, during which he was used as both a starter and reliever. His ERA shot up to 5.52 to go along with his 6-12 record. In July Carroll was demoted to Triple-A Richmond for a few weeks, but his 0.82 ERA got him back to Atlanta quickly. He initially balked at the demotion, saying he’d quit and “go into police work.”11 (Carroll had been a deputy sheriff in Clanton in the offseason, so it was not necessarily an idle threat.) In any event, he stuck with baseball, and after the season took off the weight by riding his bike in the hills around his hometown.12 He showed up in 1968 back at 200 pounds. Carroll was outstanding for the Reds the remainder of the season, appearing in 58 games and 121⅔ innings, finishing with a 2.29 ERA and 17 saves, and teaming with Ted Abernathy to form an excellent late-inning tandem. The next year he again had a heavy workload, pitching 150⅔ innings in 71 games, with a 12-6 record and a 3.52 ERA. 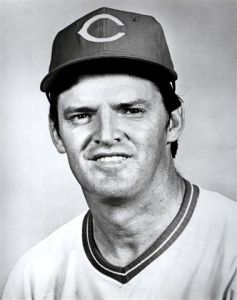 During the offseason the Reds had obtained reliever Wayne Granger, who ended up getting most of the save chances and had a great season. Carroll added, “I’ve got so much confidence in my curve that I don’t hesitate to throw it on a 3-and-2 count.”15 Carroll recorded the Reds’ only victory in the 1970 World Series. He pitched 3⅔ innings in relief in Game Four, allowing only Brooks Robinson’s eighth-inning single, after the Reds came back to take the lead and win 6-5. Carroll pitched in four of the five games, allowing no runs in nine innings. A rough start in 1973 got Carroll demoted to more of a set-up pitcher, but he still managed eight wins and 14 saves, despite his elevated 3.69 ERA. Anderson employed a deep and talented bullpen for many years, and Carroll bounced back with a 12-5, 2.15 season in 1974, then 7-5, 2.62 in 1975. In the fabled 1975 World Series, Carroll pitched in five games and allowed two runs in 5⅔ innings. In Game Seven he pitched two hitless innings and earned the victory. For his postseason career, Carroll pitched 22 innings with a 1.39 ERA, earning a 4-2 record. In his final effort, he helped his team win the World Series. After the 1975 season the Reds traded Carroll to the Chicago White Sox for pitcher Rich Hinton and minor league utilityman Jeff Sovern. The Reds were loaded with fine relievers, and shedding the veteran’s salary was the economical choice. As a member of the Reds for 7½ seasons, Carroll finished 71-43 with a 2.73 ERA. The 35-year-old Carroll pitched in 29 games for the White Sox in 1976, going 4-4 with six saves and a 2.56 ERA, numbers in line with his pitching over the previous several years. Nevertheless, the next spring the White Sox sent him to St. Louis for pitcher Lerrin LaGrow, and Carroll was again a workhorse, throwing 90 innings with a 2.50 ERA. On August 31, with the White Sox unexpectedly in a pennant race, the Cardinals dealt Carroll back to Chicago for three players, and he finished the season there. The White Sox released Carroll on March 30, 1978. Now 37 years old, Carroll signed with the Pirates as a Free Agent and pitched the 1978 season in their organization, spending most of the year at Triple-A Columbus (Ohio) before making two appearances for the Pirates late in the season. After being released by Pittsburgh in mid-October, he signed with the Milwaukee Brewers in mid-April 1979, making 12 appearances for Triple-A Vancouver before retiring. The years since Carroll left baseball have been marred by one tragic day. He had married Judy Haynes in September 1964, and the couple had three children, Brett, Lori, and Connie. The couple settled in Bradenton, Florida, but divorced in 1981. In April 1981, Clay married Frances Nowitzke, a widow who had two children of her own. He remained close to his three children and active in their lives. His world was shattered on November 16, 1985, when 26-year old Frederick Nowitzke, Frances’s son, murdered Frances (his mother) and 11-year old Brett (his stepbrother), while wounding Clay in the face, in a horrific shooting rampage. Nowitzke had been acting bizarrely for some time, and had a family history of mental illness. He pleaded innocent by reason of insanity, but was found guilty of the two murders and one attempted murder. On appeal, the verdict was overturned on grounds of prosecutorial misconduct and a retrial was ordered. Nowitzke was again found guilty, and as of 2012 was still incarcerated. Carroll later relocated to Chattanooga, Tennessee, and worked in construction. He was inducted into the Cincinnati Reds Hall of Fame in 1980, and has made appearances at team Hall of Fame events and at Reds fantasy camps. In 1992, Carroll was inducted into the Alabama Sports Hall of Fame. He is recognized as an important cog in the great Reds teams of the 1970s. 1 Earl Lawson, “Reds Have Hawk Who’s Sudden Death to Hitters,” The Sporting News, June 24, 1972, 11. 2 Ritter Collett, The Men of The Machine (Dayton: Landfall Press, 1977), 243. 3 Clay Carroll, as told to George Vass, “The Game I’ll Never Forget,” Baseball Digest, June 1981, 69. 4 John W. Chace, “Baseball Gave Clay Carroll His Ticket To A Better Life,” Tuscaloosa News, September 17, 1972, 13. 5 Frank Haraway, “Country Boy Carroll Tabbed by Tepee as $1,000 Hill Bargain,” The Sporting News, May 25, 1963, 27. 9 Wayne Minshew, “Country Boy Carroll Turns Out To Be City Slicker on Tepee Hill,” The Sporting News, September 17, 1966, 7. 11 Wayne Minshew, “Carroll Pedals Bike and Sheds Excess Pounds,” The Sporting News, November 25, 1967, 37. 12 “Carroll, Who Balked at Trip To Minors, Returns, Wins,” The Sporting News, August 19, 1967, 19. 13 Earl Lawson, “With Clay in Bullpen, Reds Sigh With Relief,” The Sporting News, September 7, 1968, 5. 14 Earl Lawson, “A Story-Book Clout by Carroll,” The Sporting News, June 14, 1969, 8. 15 Earl Lawson, “Hitters Just Putty in Hands Of Clay, Reds’ Rescue Ace,” The Sporting News, August 1, 1970, 19. 16 Earl Lawson, “Reds Have Hawk Who’s Sudden Death to Hitters,” The Sporting News, June 24, 1973, 1972.